When Henrietta Howel is forced to reveal her unique power—the ability to control flames—to save a friend, she fears she will be executed. Instead, she’s invited to train as one of Her Majesty’s royal sorcerers and declared the chosen one, the girl who will defeat the Ancients, bloodthirsty demons terrorizing humanity. She also meets her fellow sorcerer trainees, handsome young men eager to test her power and her heart. One will challenge her. One will fight for her. One will betray her. As she plays a dangerous game of deception, she discovers that the sorcerers have their own secrets to protect. With battle looming, how much will she risk to save the city—and the one she loves? 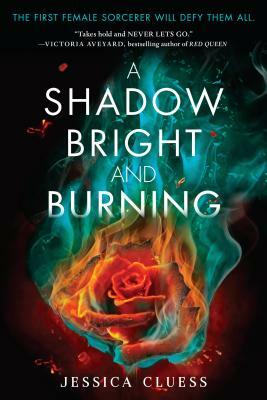 Exhilarating and gripping, Jessica Cluess’s spellbinding fantasy introduces a powerful, unforgettable heroine and a world filled with magic, romance, and betrayal. Hand to fans of Victoria Aveyard, Sarah J. Maas, and Kiersten White.